"Kanzen Chôaku Nozoki Garakuri" was premiered in the 8th lunar month of 1862 at the Moritaza [casting]. The story was based on a famous kôdan, which was itself created after a real event which happened in the 4th lunar month of 1717. The dual roles of the blackguard Murai Chôan and the honest Kyûhachi were great vehicles for stars like Ichikawa Sadanji I, Ichikawa Sadanji II or Ichikawa En'ô I. In modern times, it was successfully revived at the National Theatre in August 1979 [casting]. The story follows Murai Chôan, who is in appearance a man of integrity but who is actually an evil and cruel doctor in the district of Kôjimachi. He gave his house in his home province of Enshû to his young sister Osoyo and he settled in Edo. Osoyo and her husband Jûbê, a poor farmer, had to abandon their farmland due to Osoyo's serious illness and also heavy taxes they could not pay. Hoping to take advantage of this, Chôan tricks them into selling their daughter Oume into a house of prostitution in the district of Yoshiwara, the licensed pleasure quarter of Edo. Jûbê receives the sum of 50 ryô and expects to settle his financial problems. Chôan makes Jûbê set off for home in the middle of a rainy night and then runs ahead of him to lie in wait at the Akabane Bridge. He kills Jûbê and steals the 50 ryô. Intentionally Chôan leaves a paper umbrella, as an evidence of the crime. This umbrella belongs to the rônin Fujikake Dôjûrô, who forgot it when he visited Chôan's clinic to pay for some medical treatment. On his way home, Chôan is spotted by a man named Kaisaka no Chûzô as he passes near the Hirakawa Tenjin Shrine. The next day, Jûbê's body is found and people connected with him have been called to the police station. Chôan's trick makes a false charge against the rônin Fujikake Dôjûrô using the discovered umbrella as false evidence. Due to Chôan's cunning idea, Dôjûrô is captured, accused of murder, thrown into the prison at Ôdenma-chô where he will die miserably (gokushi). Shocked at the news of her husband's murder, Osoyo has rushed from Enshû to her brother's home in Edo. She declares that she wants to see her daughter Oume. She is easily swayed by Chôan who talks her out of it. Sufficiently unsettled by his sister's arrival to fear that suspicion might fall on him, he secretly arranges for one of his henchmen, Hayanori Sanji, to kill his own sister. Meanwhile, Oume, who is now a Yoshiwara courtesan called Sayoginu, works at the Chôjiya brothel where she has quickly become one of the leading courtesans. Sentarô, the young son of Iseya Gohê, a prosperous pawnbroker (shichiya) in the district of Kanda Mikawa-chô, and the adopted son of late Fujikake Dôjûrô, is in love with her. Sentarô is desperately looking for money to ransom Sayoginu. He visits Chôan to pay the money to redeem Sayoginu and buy her out of prostitution (miuke) so that he can marry her. Unfortunately, Chôan has laid a nasty trap for Sentarô. The young man hands over the necessary 50 ryô, but it is not his own money. He had obtained it by secretly selling a valuable short sword that had been put into pawn by a customer at his father's shop. Unfortunately for Sentarô, that customer was none other than Hayanori Sanji, Chôan's henchman. Chôan had set the whole thing up to trap Sentarô. He berates the young man, and sends him away. Pretending to be taking her to Yoshiwara to meet her daughter, Hayanori Sanji leads Chôan's sister Osoyo into a rice field and kills her. Knowing that Sentarô had secretly sold his sword, Chôan has sent Hayanori Sanji to the Iseya to blackmail Sentarô. He was thwarted by the honest and loyal bantô Kyûhachi, who had realised what Sanji was up to. Kyûhachi claimed the responsibility for the misdemeanour himself and was thrown out. 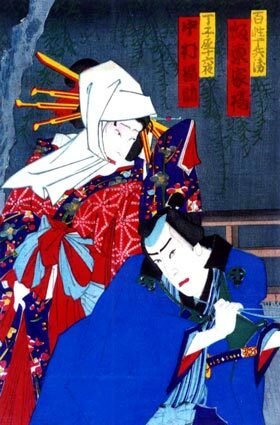 Fujikake Dôjûrô's wife, Oriyo, is in dire straits, living a miserable existence with her children in a poor rented house. She has almost no belongings but calls a kamikuzuya to sell some clothes. This man is none other than Kyûhachi. She tells him that her husband, wrongly blamed for Chôan's crime, has died in prison (gokushi). Their son Michinosuke had been working as a peddler but had fallen in with a bad lot and had his earnings stolen. Feeling sorry for her, Kyûhachi gives her some money. Kaisaka no Chûzô from comes along and while they are talking together with Kyûhachi and Oriyo, he recalls the suspicious behaviour of Chôan at the Hirakawa Tenjin Shrine and realises that he must be the real murderer. Oriyo and Kyûhachi, with the support of Chûzô, decide to team up to go to the court of justice to register a complaint against the evil doctor who is responsible for their downfall. The michiyuki  is set at the Nihon Embankment, the road leading to the Yoshiwara pleasures quarter. Sayoginu has escaped from the Chôjiya, to be with her lover Sentarô. Dark thoughts revolve in their minds for they will soon commit a shinjû. Hayanori Sanji, who is tracking down Sayoginu, successfully catches her. Left alone, Sentarô tries to kill himself but Kyûhachi rushes up and stops him. In the ensuing scuffle, however, Sentarô is accidentally killed. Instead of running away, Kyûhachi decides to give himself up to the authorities. The final act is set at the court of Justice (shirasu). The judge is the upright and wise machi bugyô Ôoka Echizen-no-Kami Tadasuke . Because of Chûzô's accusation, Chôan is brought before the court. He denies everything but, thanks to the skilful questioning, wisdom and perspicacity of the judge Ôoka Tadasuke, the confusion of conflicting statements is finally resolved in the spirit of kanzen chôaku: Murai Chôan and Hayanori Sanji are condemned and jailed. Kyûhachi is found not guilty of Sentarô's death. Sentarô is posthumously reinstated. Kyûhachi discovers that Sentarô is in fact his real brother and he is adopted by Iseya Gohê. Kyûhachi shall inherit the Iseya Shop. It is a tradition to have the same actor performing both the evil Chôan and the loyal Kyûhachi. A Tokiwazu musical ensemble is used in the 6th act to perform a jôjûri which is entitled "Urami Kuzu Tsuyu-ni Nureginu". 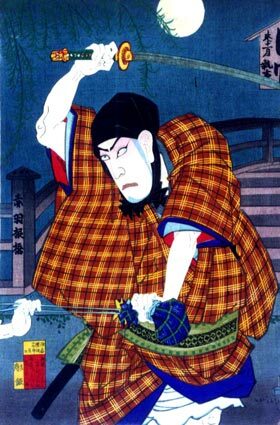 The magistrate was named Ôdate Samanosuke in the 1862 production, not Ôoka Echizen-no-Kami Tadasuke; this was changed in the later revisions.